Happy New Year! Start this year off right by creating a plan to achieve your health and fitness goals. This printable Fitness Planner is the perfect tool to help you get started! 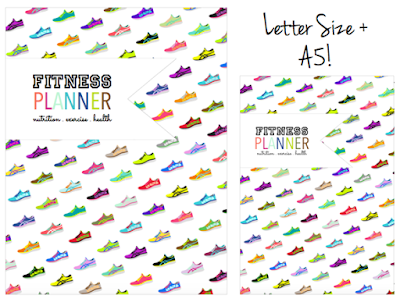 This colorful planner comes with files for both Letter Size and A5. 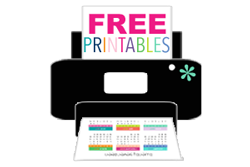 If you need another size you can always resize pages using your printer settings. Pages are in order and ready for 2-sided printing. As always, I suggest looking over your files for download errors before printing and also printing in small groups to avoid wasting paper and ink. 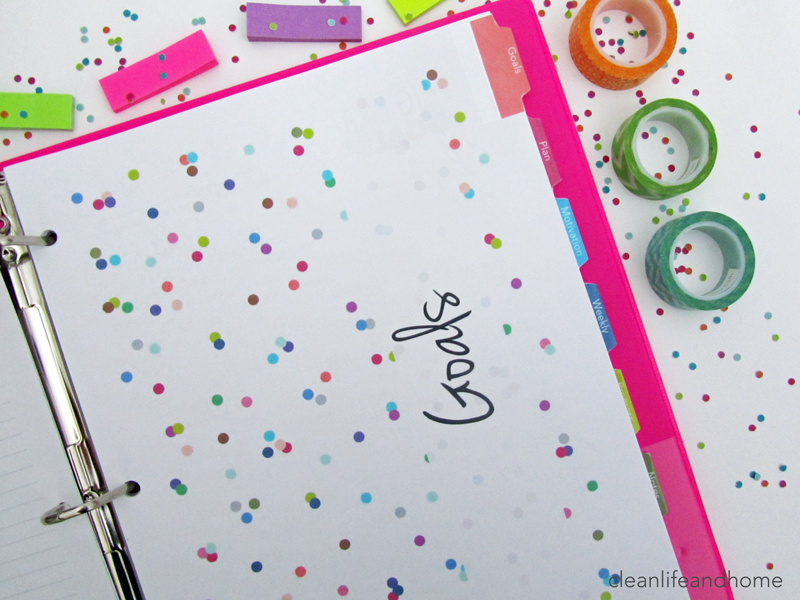 I've included fun polka dot divider pages to keep things bright and cheery. 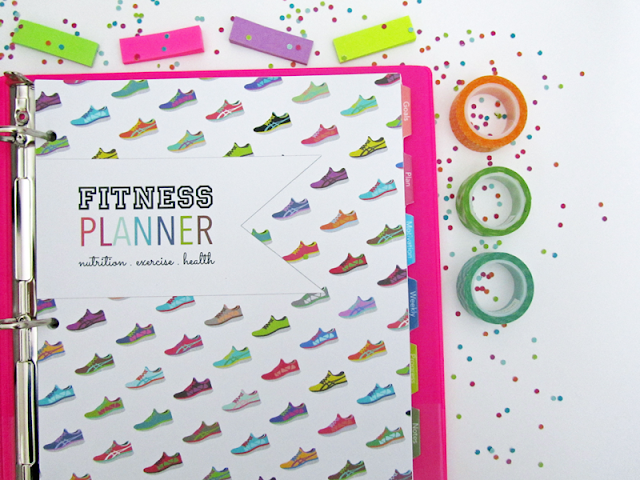 These pages are colorful, but easy on your printer ink. There are 6 sections in total and matching divider tabs are also included. 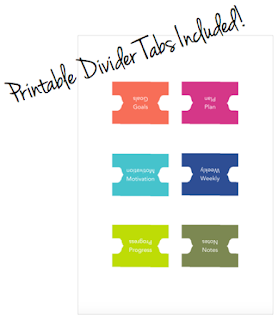 You will need to cut and assemble the tabs using these easy instructions. 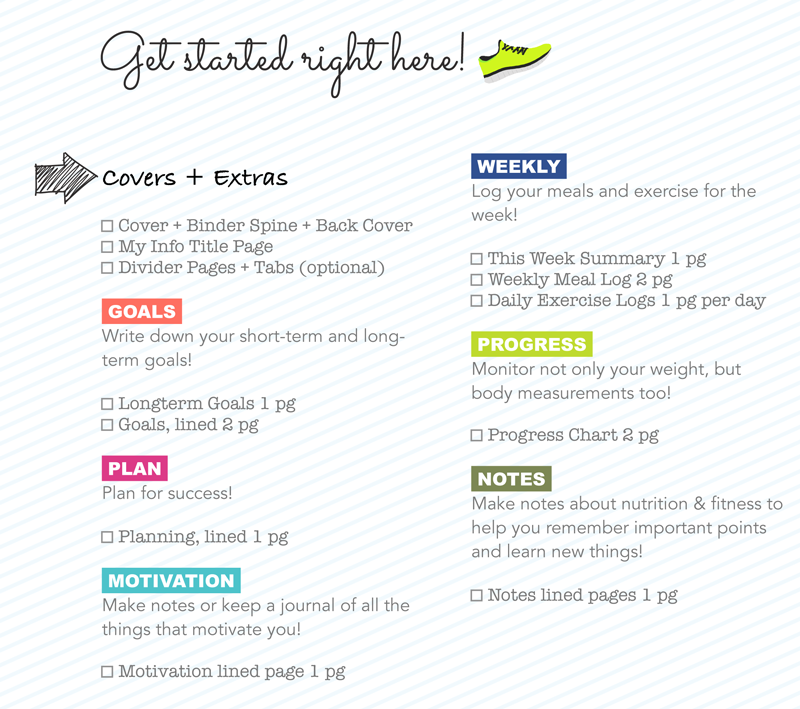 Set some goals for health, nutrition and fitness using this fun goal setting page! 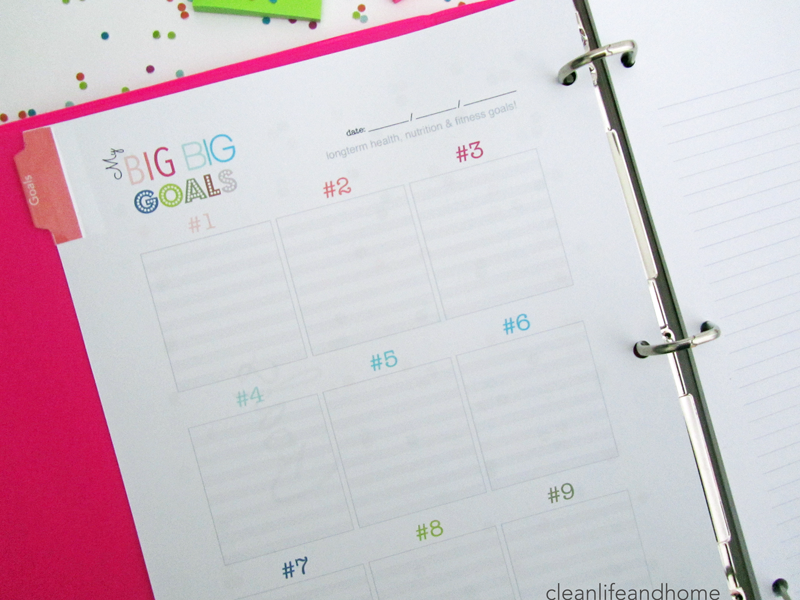 There are 9 spaces and this section also includes lined pages for you to write out your goals in more detail. Create a plan using these lined pages. 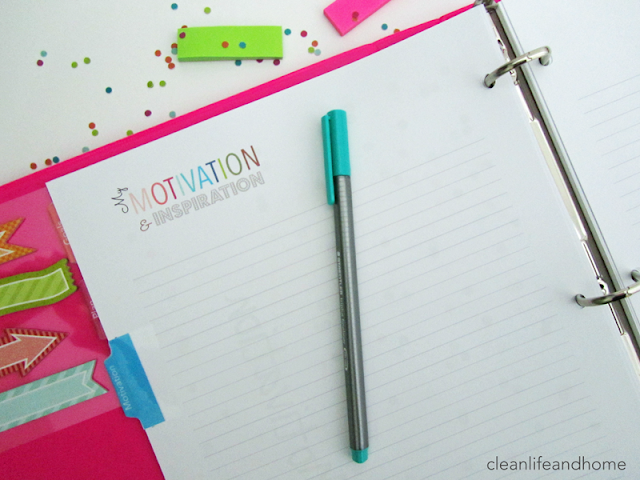 Write out your meal plan, workout plan, changes you would like to make, bad habits you need to break- anything you want! 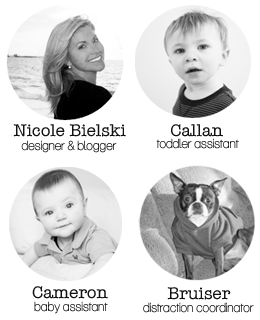 What is your motivation for starting this plan? 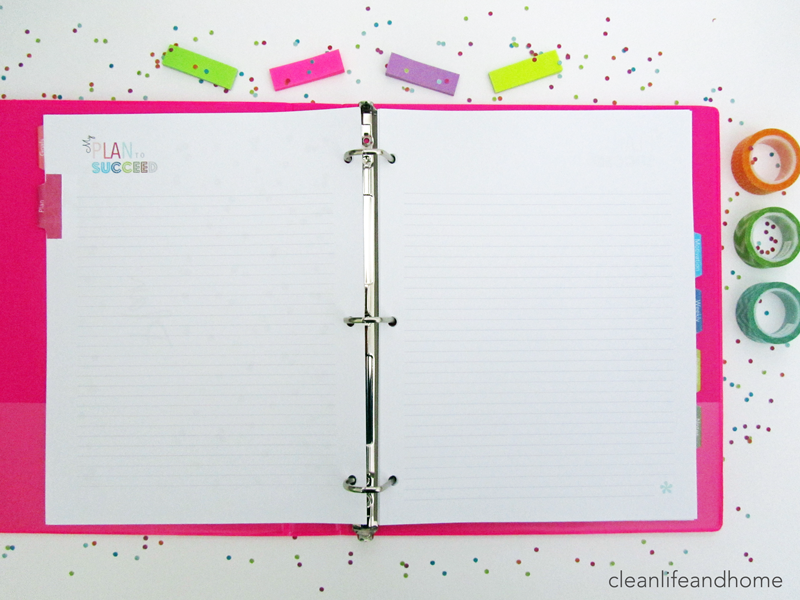 You can also include your own pages in this section. You can create a vision board photo collage, print it out and add it to your planner! 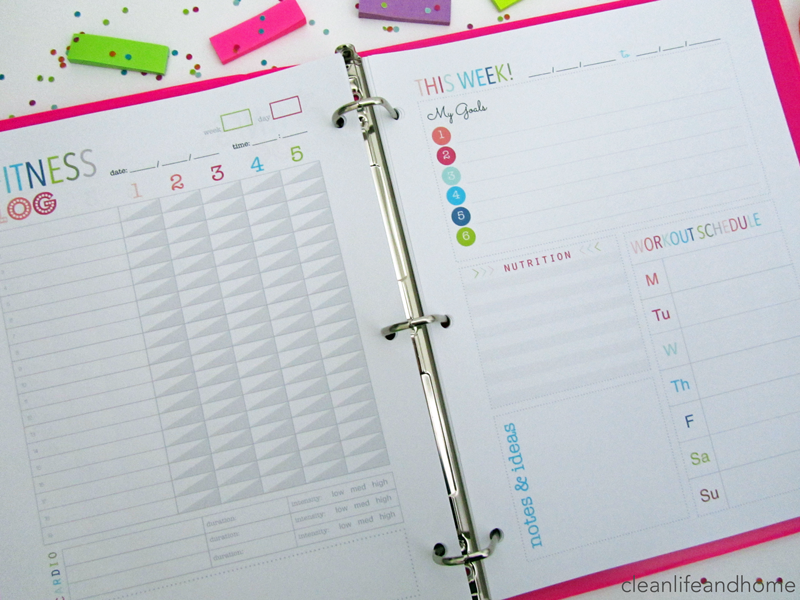 There are 12 weeks of pages setup in order already and I've included a One Week Easy Fill file so you can easily print out additional weeks and add them to your planner. 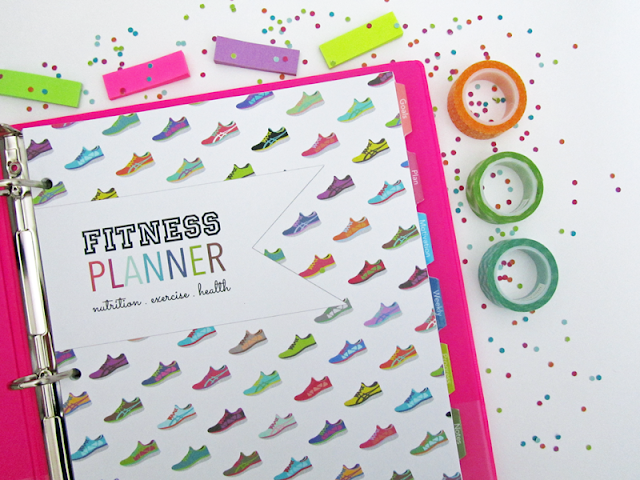 Remember- you can print extras of any page you like and you don't need to print the whole planner at once if you would rather print a little at a time! Each week starts with a weekly planning page to write out your goals, schedule and any notes you need to make. 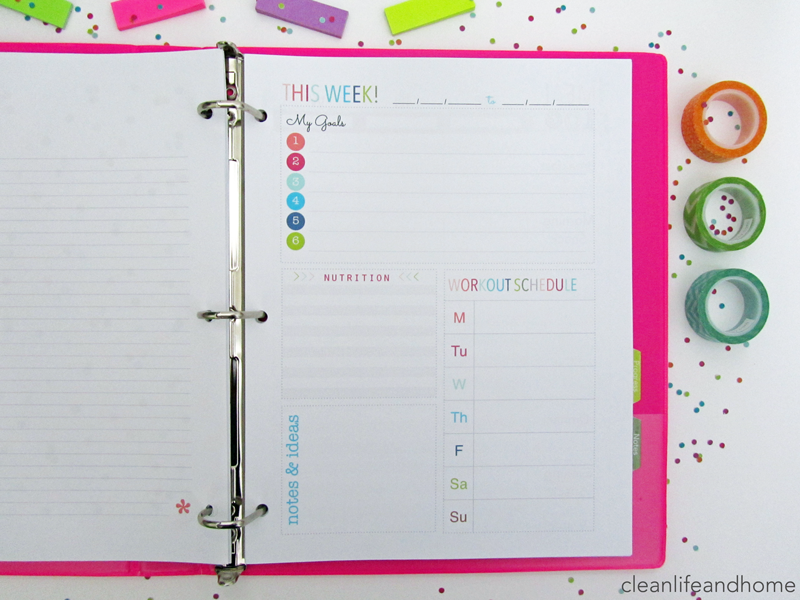 There is a Weekly Meal Log at the beginning of each week. 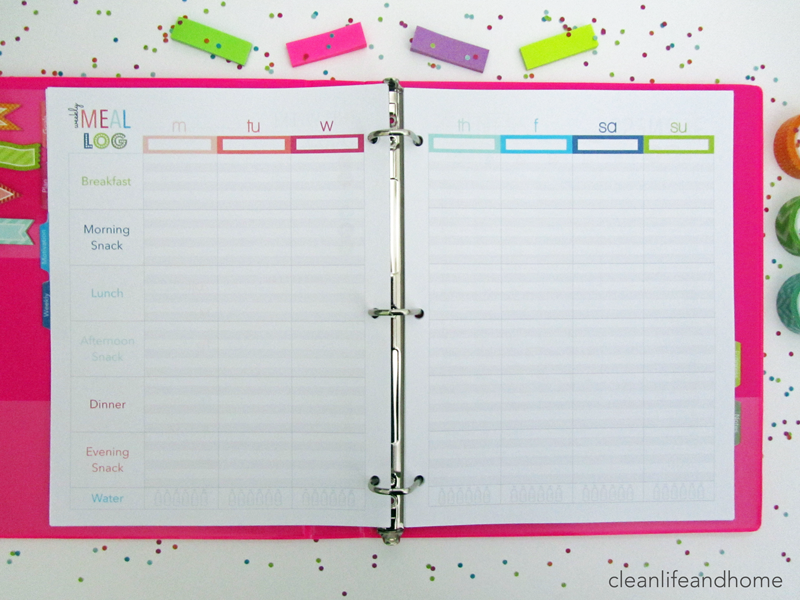 You can fill in the dates in the white boxes under each day and either plan meals in advance or log as you go. There's also a hydration tracker for each day. I usually make each water bottle = 1 liter and try to drink 4 liters a day. 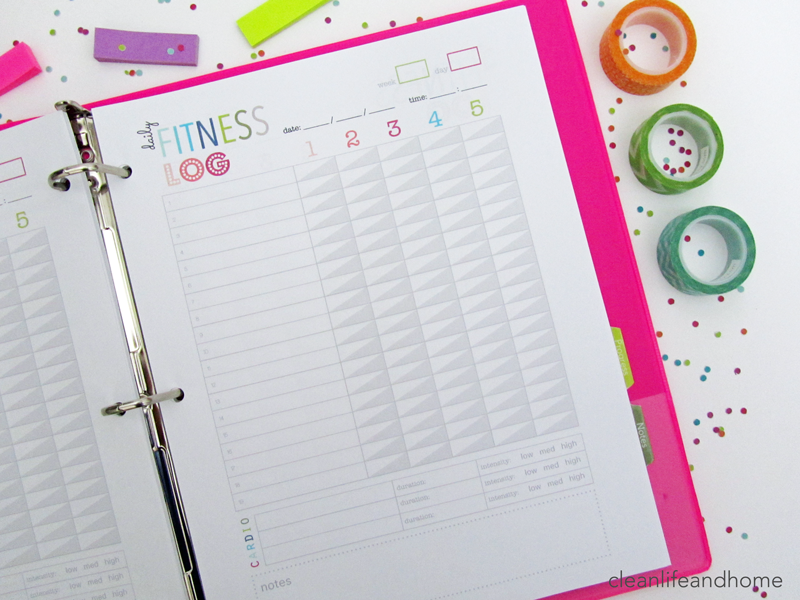 There is a Fitness Log for each day of the week. Record your strength training, exercises, cardio and make notes. If you, for example, go to a fitness class that day you can write that into the notes section and record the duration and intensity under the cardio section. 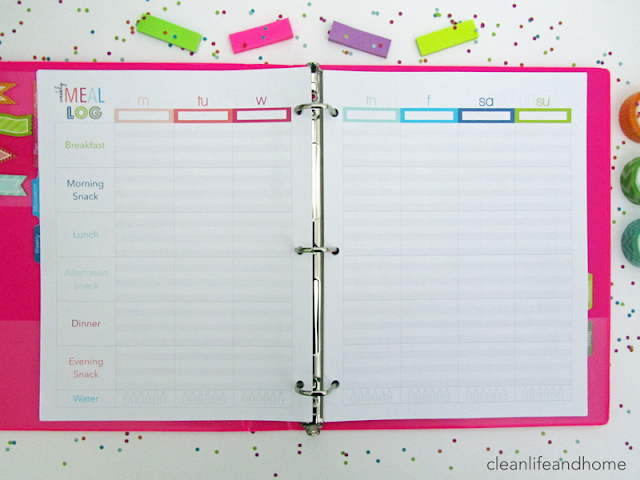 This progress chart will help you track physical changes! This chart includes weight, body fat, measurements, pant/shirt size and weekly spaces to record the date. Measure as often as you like! I use a sewing tape measure (because they're about $1 and much cheaper than a tape specifically for body measurements) that I got in the craft section at Walmart. Sometimes the scale doesn't reflect the changes you're making and you can even gain weight as you gain muscle. 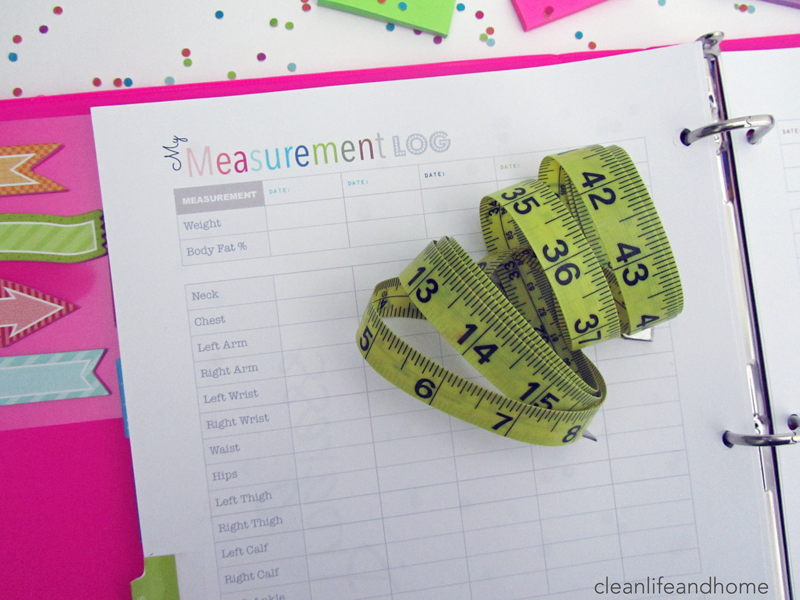 Body measurements are typically a more reliable way to track, but keep in mind that measurements will fluctuate just like your weight. Are you bloated? 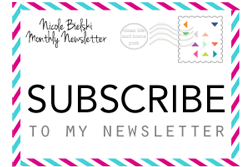 Make a note at the bottom of the page! 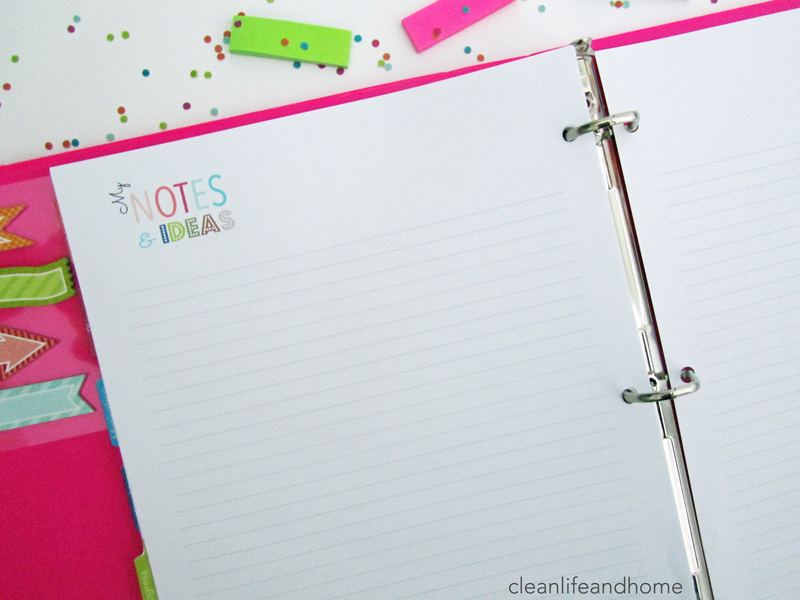 I always have to include a notes section! You can use this section to record any ideas you have or future plans! 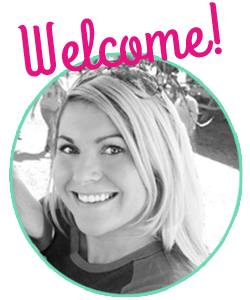 Odds are you're going to have things you want to remember or things you need to change for your next fitness plan. 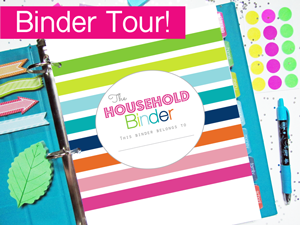 This planner is available as an instant download so you can get started planning right away. 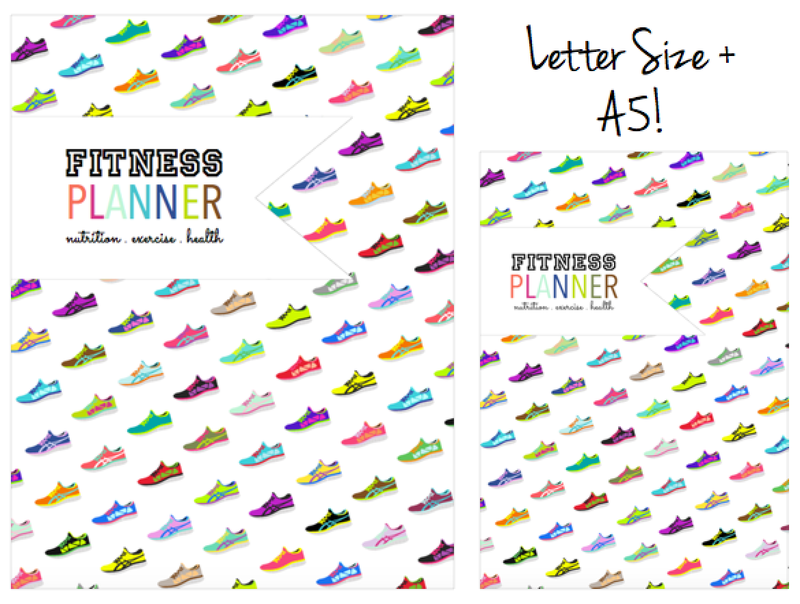 Purchase a Printable Fitness Planner in Letter + A5 Sizes!